I am an English teacher from Den Haag , Holland. I teach at the most international school in the Netherlands, with about 65 nationalities. I have also organised a sportsprogramme called Sportcampus for the past 25 years. Football, basketball and Volleybal are the main assets of this programme in which we teach kids from all walks of life to become real sportsmen/women, winning and losing, and to make doning sports a part of their lifestyle. Over the years of its short existence FC United of Manchester have received an unparalleled amount of attention, given the level that they play at: the Northern Premier League ( the 7th tier of English football). Of course there are numerous reasons for the wealth of articles and (international) documentaries, first and foremost the fact that they left the most popular club in the world – Manchester United – to build their “world of our own”. More than enough has been said about the how and why of the coming into existence of “the rebel club” or “the other United” or even “little United”, both sense and nonsense, but one thing the two teams do have in common is their attraction to foreign fans. With Manchester United it is even one of the reasons why many diehard fans left and joined FC United of Manchester: the endless stream of camera selfie flashing, fortune seeking tourists who only seem to want one thing, be there and gape at the stars. Then go home to tell about it at the office or other workplace, gloating over the pictures that they have taken prematch, during the whole match, and after the match. Likewise FC United of Manchester attract a great deal of foreign attention, albeit of a rather different kind. Like its big stepbrother it has its international branches, such the German, Polish and Nordic branch. There are visits from likeminded clubs, like Cap de Cuidad de Murcia from Spain and Skt Pauli from Germany. And there are individuals from all over the world who one way or another have been hooked by the FC United feeling and are willing to go long ways to vist “their” team. 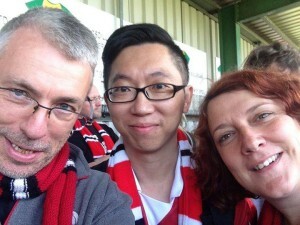 Coincidentally this weekend will almost bring together the two of the most remarkable foreign fans/co owners, Linus Lind and Ming Fan. Almost, because the day after the one has left for China again after a 9 day stay with four games to watch, the other one will arrive on his bike at the almost finished site of the new Broadhurst Park Stadium in Moston, one of the few fan built stadiums in the world ( but that’s another story again). Linus Lind is a psychology student from Uppsala, Sweden, who has been along as a fan for a while and has already visited a respectable number of games, given the distance. 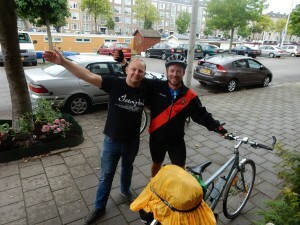 This summer he took it upon him the embark upon a Bike Ride for Charity – Doctors Without Borders, a worthy cause – taking him through 7 countries and to the doorstep of the new stadium of his favourite team. Linus is not your typical endurance athlete, looking for the ultimate challenge. In fact he is an easy going, intelligent and well mannered Viking, not with the physique of a bike rider, but rather a compact defensive midfielder. He loves good food, a beer or two and salsa and of course he is raving mad for setting out on this trip. However, if this is not remarkable enough in its own way there is at the same time an even more unlikely visitor. 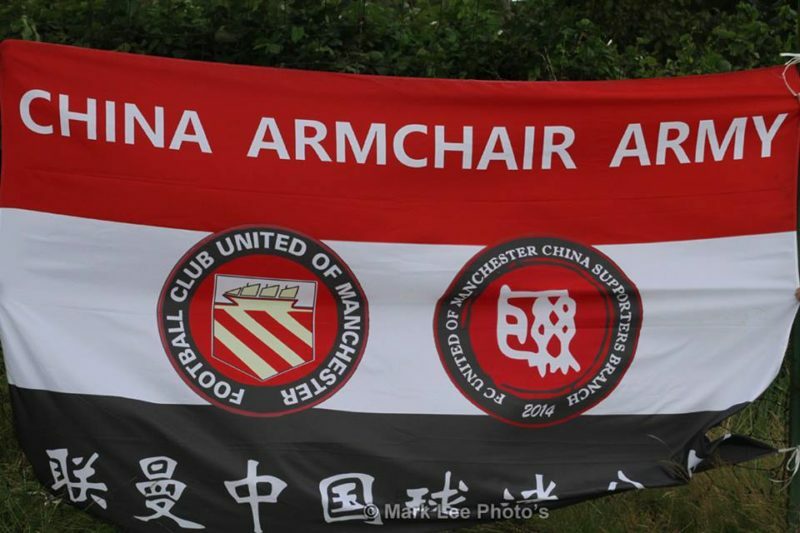 It is Fan Ming, Ming Fan for many a Mancunian red who are not that familiar with Chinese names, or just Fan – a poignant contrast to the Van…s at the other United – another thirty something old FC United fan ( pun not intended) who has travelled 9000 km to see 4 games in 9 days and will leave an indelible mark on the faithful. 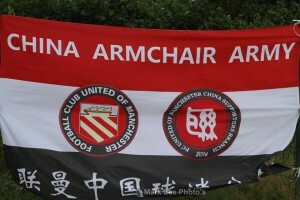 With his FC United Chinese Branch banner , his enthusiastic interest for anything FC – visiting the head office, the new ground etc. – and his charismatic personality he has endeared himself to all and everyone. When he heads home he will leave behind a lasting memory for many a reminiscing over a lager or an ale. If the two almost coinciding visits show one thing , it is the irresistable attraction of this club with its motley crew of fans calling themselves “a rightful bunch of dicks”. The combination of down to earth, humorous Mancunian stubbornness and the fan owned principle, where everyone has an equal say in club matters, leaves ripples wherever they go – their European trips are legend – and where publicity presents them. Not very much unlike Manchester United. There is however one big difference, the foreign fans do not come as tourists, but as co owners proud to be a part of the dream.